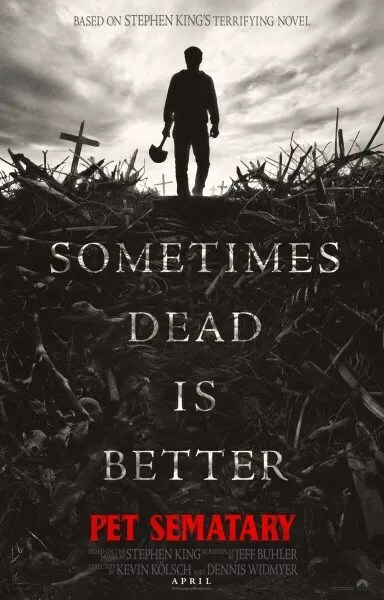 ‘Pet Sematary’: First Poster Confirms That Sometimes Dead Is Better!! Check It Out!! | Welcome to Moviz Ark! ‘Pet Sematary’: First Poster Confirms That Sometimes Dead Is Better!! Check It Out!! Paramount Pictures has released the first Pet Sematary poster ahead of the trailer debut for the new Stephen King adaptation, which is coming tomorrow. Starry Eyes filmmakers Kevin Kölsch and Dennis Widmyer direct the new horror film from a screenplay by Jeff Buhler (Nightflyers) which revolves around a doctor (Jason Clarke) and his family who move from Boston to rural Maine and discover a mysterious burial ground. When tragedy strikes, the doctor turns to his unusual neighbor (John Lithgow), setting off a series of terrifying events. King’s novel was published in 1983 and remains an iconic piece of horror literature. It was previously adapted into a film in 1988, which itself spawned a feature film sequel called Pet Sematary Two for which King asked to have his named removed. This recent redo has been in the works for years, with Guillermo del Toro attached to direct way back in 2010. The film is now finally getting off the ground thanks to Paramount. This poster boasts an iconic line from the novel and some incredibly creepy imagery of the burial ground. It’ll be interesting to see what Kölsch and Widmyer bring to the material, and if audiences spark to this film as strongly as they have to other recent King adaptations like It, Gerald’s Game, and Castle Rock. Take a look at the Pet Sematary poster below and check back tomorrow morning to watch the trailer. The film also stars Jeté Laurence and Hugo & Lucas Lavoie. Pet Sematary hits theaters on April 5, 2019. ← ‘Fair Game’: Doug Liman Re-Edits The 2010 Drama To Re-Release On Netflix!! !